The troubles on Gilly have been delayed until they can mine some more fuel, so what can we do while waiting for the outer-system ships to arrive at their destinations? 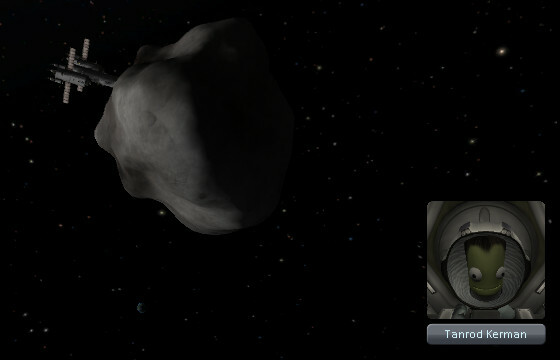 We seem to have somehow managed to start tracking some class-E asteroids in the tracking station. I suppose we should do something about that. Let's recruit a pilot (they have them again! Finally!) and build an expensive asteroid capture ship. 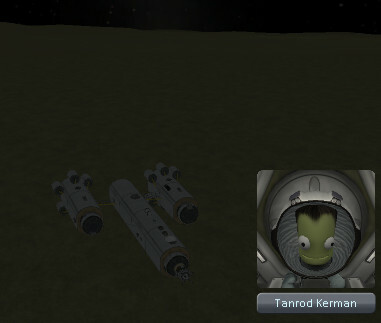 Ok Tanrod, let's capture an asteroid! 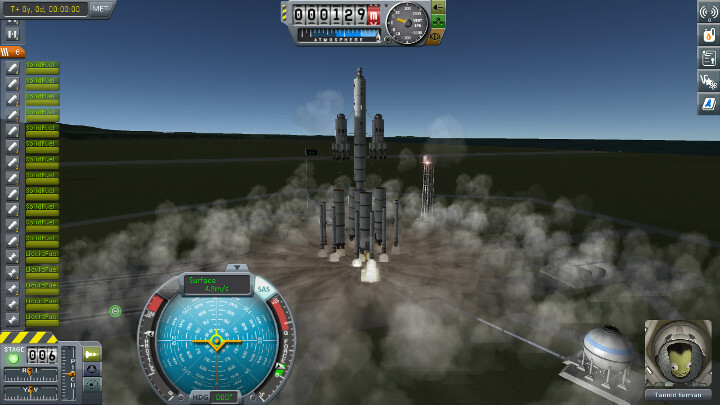 Well that one didn't even reach orbit. Let's try that again. Hmmm this looks a bit sub-optimal. More struts? Although it was a bit touch and go clearing the atmosphere. Come on Tie-rod, let's get that asteroid. We did eventually get there, though we burned through a lot of fuel changing our inclination, and by the time we docked we were already past apoapsis. We wasted a lot of time trying to slow the asteroid down. Our level-0 pilot and underpowered SAS meant we were firing off axis which was a pain. Eventually the whole mission was called off. Inanimate-carbon-Rod, let's come home and rethink things. Can he come home? Luckily for some reason the designers put some parachutes on this thing. 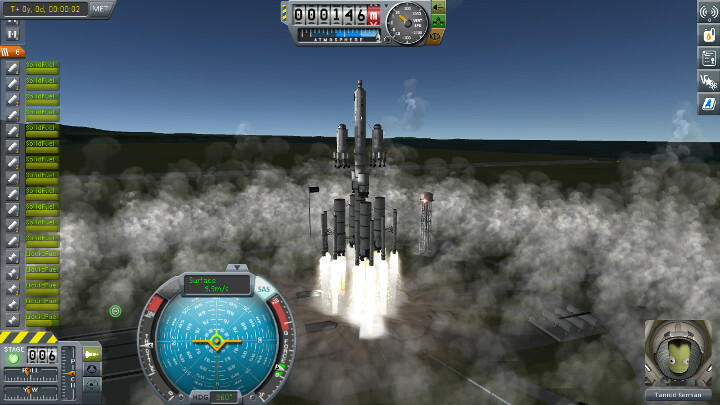 The only way to land though was to make a series of aerobraking passes at 58km which gradually slowed us enough not to explode. Will the parachutes be enough? Surprisingly, yes. An unexpected amount of the ship survived too. Let's launch an updated ship with a lot more SAS and a Level-1 Tanrod. 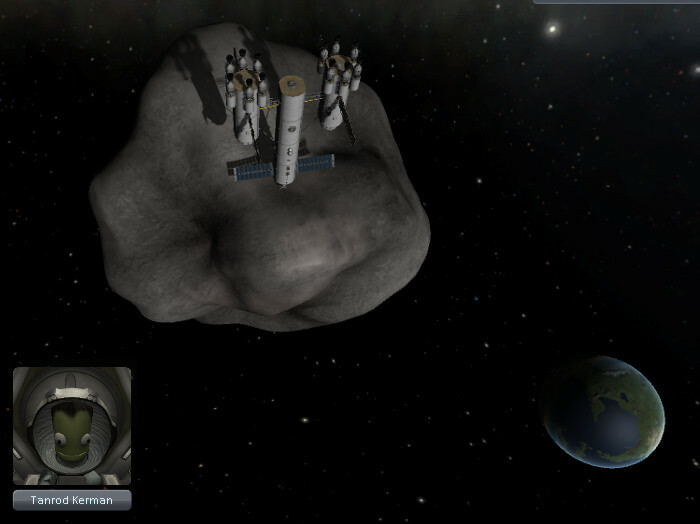 We heard a rumor that catching the asteroid outside of Kerbin's SOI would make things easier. 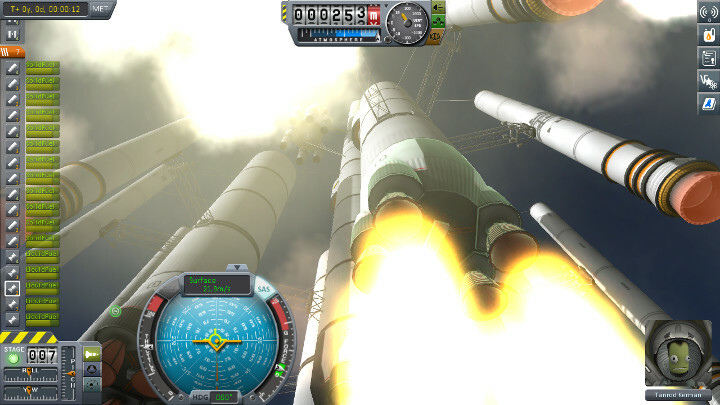 So we tried that, and even more-or-less properly eyeballed the inclination directly at launch. 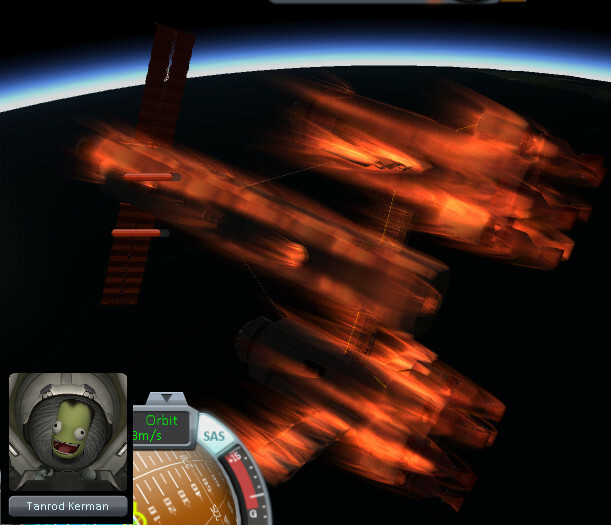 The ship kept exploding and/or warping hundreds of kilometers during docking. 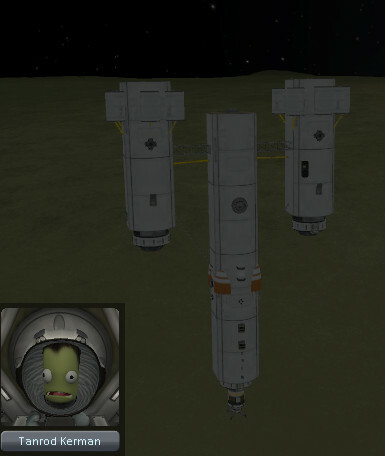 It took a while to figure out the problem was we were trying to dock *exactly* as we were crossing back into Kerbin's SOI. 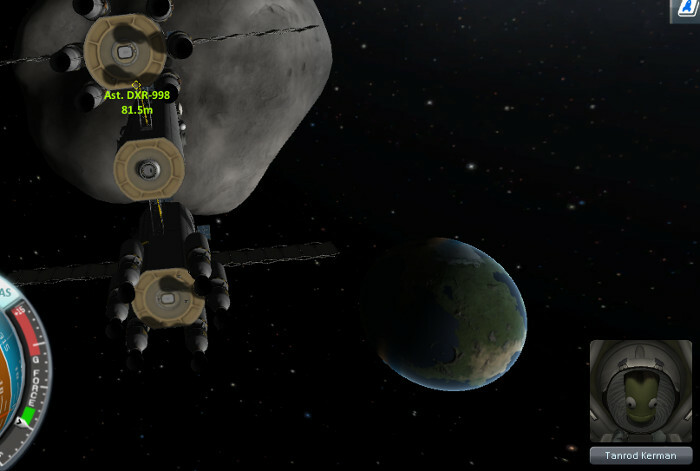 Waiting until we were safely over and we finally docked OK. Much further from Kerbin than the previous asteroid. 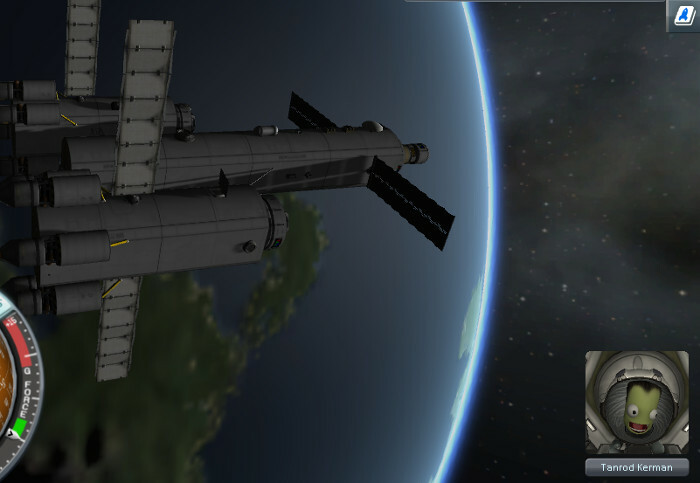 And we had just barely enough fuel to get this thing into orbit (you can just barely see Kerbin there). 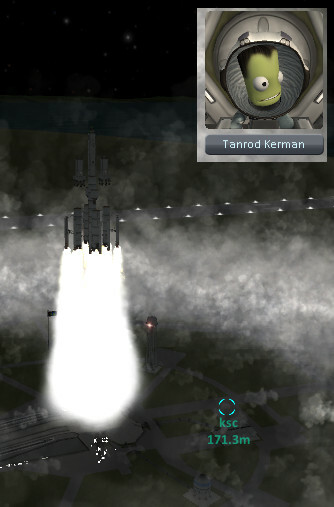 Hopefully it's close enough to stay but far enough out that Minmus doesn't eject us. We should probably send another ship out to bring us in closer.